Wrangell mountains, fall colors, sedimentation rock layers ad striations, aerial photo, Wrangell - St. Elias National Park and Preserve, Alaska. Please click on the image above to view a larger version of this photo. 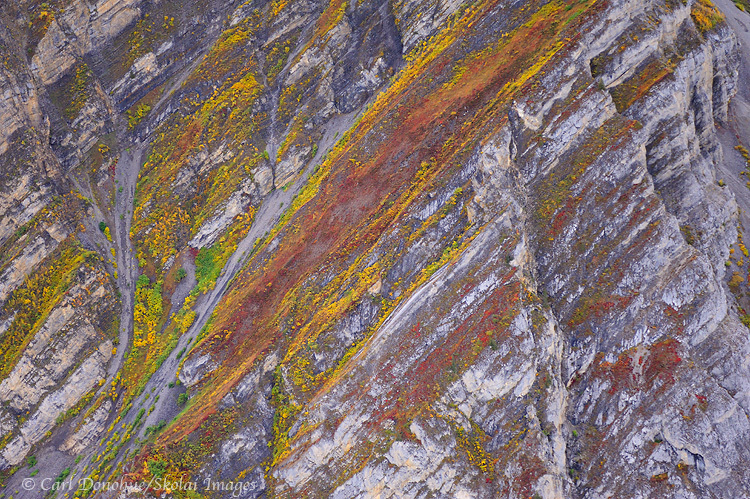 An abstract aerial shot of the Wrangell Mountains, with a little fall color thrown in. Wrangell – St. Elias National Park and Preserve, Alaska. I’d actually asked the pilot to fly us up in this area in the hope to find a particular glacial scene I wanted to reshoot, but the great patterns and colors along the ridges above the glacier were more interesting; in part because we didn’t find what I was looking for anyway. Aerial photography is an exciting challenge; trying to see compositions that work in camera from such an unusual perspective is harder than one might imagine. The sensory overload of flying through such magnificent scenery, and the sheer novelty of perspective makes it easy to simply shoot everything, and come back with a bunch of images that don’t really work. For myself, I find shooting tighter and really concentrating on shapes works best. I’m curious to hear what readers think and feel about this image; I’d love to hear your comments. This entry was posted in Abstract Photos, Adventures, Aerial Photos, Alaska, Art, Fall, Landscapes, Photo Tours, Photography, Wrangell - St. Elias National Park and tagged Aerial Photos, Wrangell - St. Elias National Park, Wrangell Mountains on October 7, 2011 by Carl D.